Willa Coffey hasn’t seen her father, Dwayne, in many years. He was abusive to her as a young child, and to her mother. Her mom ran away from their home in Pryer, Texas to get away from his abusive ways. They now live with Willa’s stepdad, Jack, and her two half sisters, Brooke and Alyssa. Brooke and Alyssa’s mom have a lot of money so they tend to get whatever they want, whenever they want. Willa is the opposite of her half sisters. Willa came home from school one day to find that her mom’s friend, who lives in Pryer, had left several concerning messages for her mom about a man named Budge. Her mom was hard to reach, but between Jack and Willa they got a hold of her. Come to find out, Budge is Willa’s dad’s nickname. After arriving home, Willa’s mom called her friend back and found out terrifying news. Budge had gone missing with one of his daughters, after stabbing his new wife and two other daughters to death. After investigating, the police found out that Budge is on his way to Willa and her mother. They are immediately moved into police protection, and moved out of their home for a few days. On top of all this, Willa has an addiction of cutting herself when she’s stressed, and this tragedy isn’t helping her to stop. How will Willa and her family deal with this tragedy? Does Budge mean any harm? How will Willa face her friends knowing she’s the daughter of a killer? 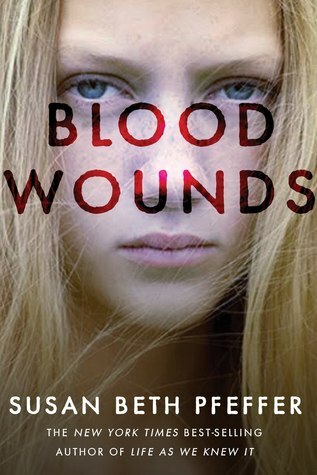 Blood Wounds keeps you wanting to read more throughout the entire book. Susan Beth Pfeffer added many of Willa’s feelings and thoughts all through her book. Overall, it helped me to understand the book better. Willa tries to learn more about her dad. She later finds out details on her dad’s side of the family, and eventually meets them. This book takes place in present day Pryer, Texas. This is a good read for boys or girls who enjoy mystery and suspense. I was quite shocked at how the book ended. I expected it to be suspenseful all the way to the end. I overall enjoyed reading this book.